The patient is fixed in a moldable "bean bag" form with both arms tucked in, and placed in a modified lithotomy position using Levitator stirrups. 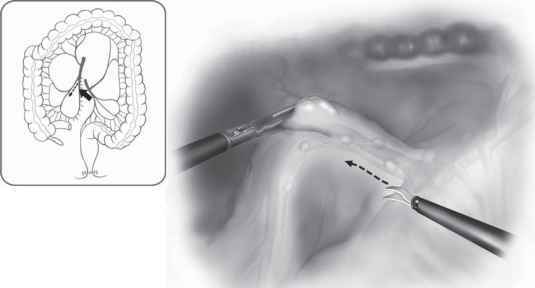 We prefer the Hasson (open) technique to safely insert the first port through the umbilicus. After establishing pneumoperitoneum, the surgeon stands on the patient's left side to expose the right mesocolon and to mark the lower border of the ileocolic vessels. Next, the surgeon moves between the patient's legs, the assistants position themselves on the patient's left side and the nurse stands near the patient's right knee (Figure 8.3.1A and B). The main monitor is placed near the patient's right shoulder to give the surgeon and the assistants optimal viewing. The second monitor is placed on the left side close to the head, a location that gives the best view for the nurse. After completing the proximal vessel ligation with lymphadenectomy and mobilization of the terminal ileum and the cecum, the surgeon moves back to the patient's left side and the first assistant stands between the patient's legs for take-down of right flexure and whole mobilization of the right colon (Figure 8.3.1A). Figure 8.3.1. Positions of the equipment and the surgical team for the laparo-scopic right colectomy. A Initially the surgeon is at the left side of the patient, and returns to this position after lymphovascular pedicle ligation. B The surgeon assumes a position between the legs for optimizing the approach to the dissection of the mesenteric pedicles. How to setup the lithotomic position? How is a patient set up on their side for surgery?